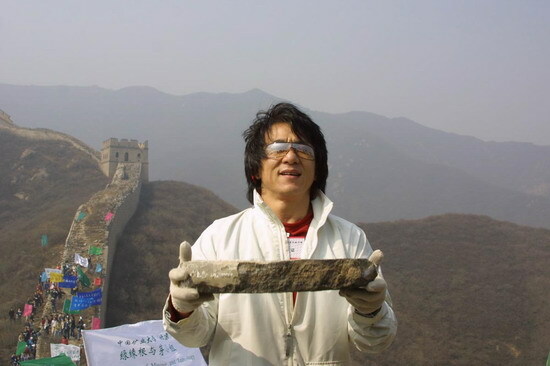 Action star Jackie Chan has planted trees near Beijing's Great Wall to promote the awareness of environmental protection, in an effort to build a Green Great Wall in China. 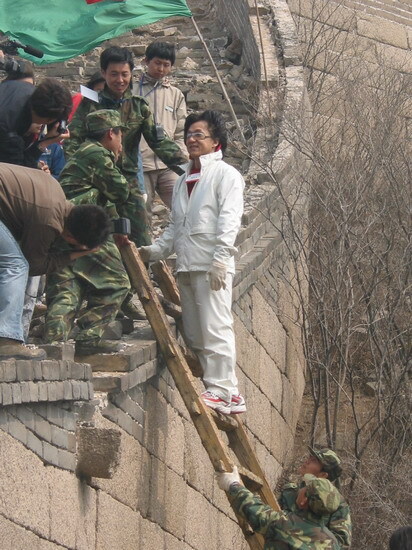 Along with over 200 college volunteers, the movie mogul climbed up the Badaling Great Wall in northwest Beijing to kick off another round of the Green Great Wall project. 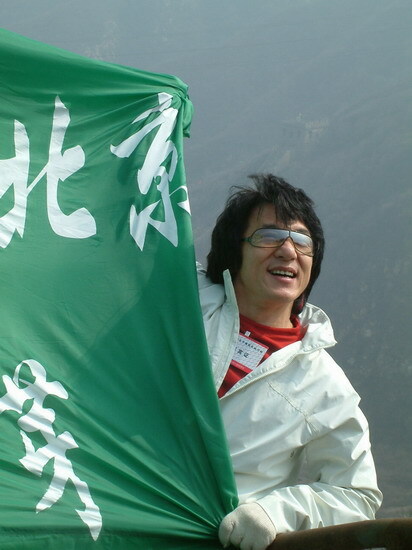 The film star was also appointed an Environment and Culture Ambassador by the State Environmental Protection Administration. 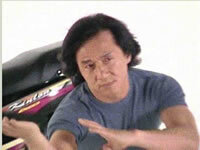 Click this photo to see a little movie of Jackie filming a motorcycle commercial last year! Check out Jackie practicing a fight with Donnie Yen for the upcoming "Twins Effect 2"
These are Official JC Group photographs of Jackie.....true collectors items! The Kids Corner "Around the World in 80 Days" poster has shown up once again on the front page of a Chinese newspaper (The Sun)! This photo is sure making the rounds. The poster was originally created by the Kids Corner webmaster to accompany the Around the World in 80 Days pages on the Kids website. 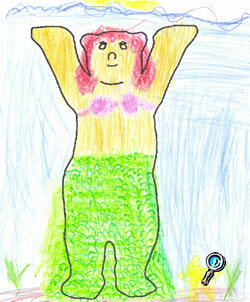 Apologies to 9 year-old Sarah who sent in a couple of wonderful Buddy Bear designs. One of her creations never made it up onto the Buddy Bear pages! Here it is for all to see. 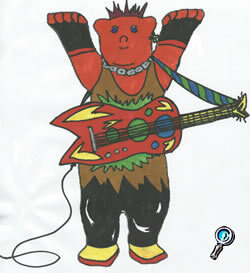 Click on Sarah's Buddy to see ALL of the wonerful Buddy Bear designs that have been sent in! There's also another wonderful Buddy Bear design posted in the Kids section. Stay tuned for a view of the cool "Buddy Bear Book" that the Kids Corner sent to Jackie! Coming soon!!! It's been a while since we've seen a new coloring page from Holly. Here's the latest....and it's a really cool one! Click to go to a printable version of this drawing! The Hong Kong Information Services Department has posted the information about the Buddy Bears in Hong Kong. The COOLEST thing about this is that the message is posted on a section of the website which is entitled "Hong Kong for Kids." It is an AWESOME website for kids who are interested in learning more about their Hong Kong contemporaries! Click below to visit the site or click here to read just the announcement about the Buddy Bears. Tons and tons and tons of new Buddy Bear designs from Kids (and one from a "big kid") are now posted here at the Kids Corner! Click here to see them all. Check out the new drawing in the Jackie Chan Art Gallery! 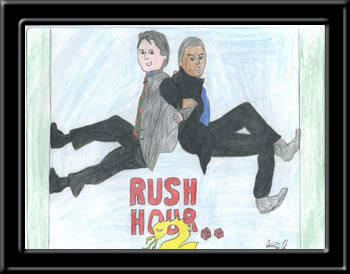 Thanks to Marc from England for sending in this wonderful drawing. United Buddy Bears to Visit Hong Kong!!! Although this exciting news has been known for some time, it is only today that the Kids Corner is able to share the announcement - The United Buddy Bears are coming to Hong Kong! Click here to read the announcement on the Hong Kong for Kids website. HONG KONG, March 26 (Xinhua)-- More than 120 colorful Buddy Bears, which are all hand in hand to deliver the message of solidarity, tolerance, and understanding among nations on a world tour, will be saying hello to Hong Kong people in May. 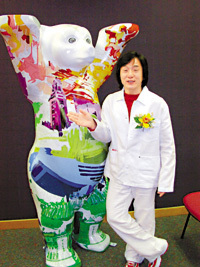 A government spokesman announced on Friday that the United Buddy Bears Exhibition, co-organized by the Leisure and Cultural Services Department, the Home Affairs Department and the Jackie Chan Charitable Foundation, will be held from May 16 to June 27 inVictoria Park. 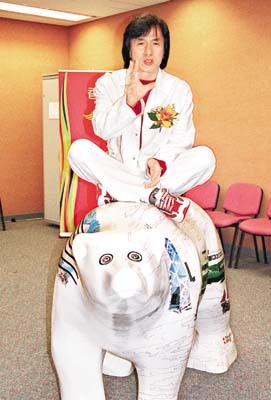 He said the idea of bringing the Buddy Bears to Hong Kong was initiated by Jackie Chan, a famous movie star and founder of the Jackie Chan Charitable Foundation. When Chan was filming in Germany, he was so fascinated by the enchanting Buddy Bears on the streets that he made a special visit to the Buddy Bear workshop of creators Dr. Klaus Herlitz and his wife Eva. 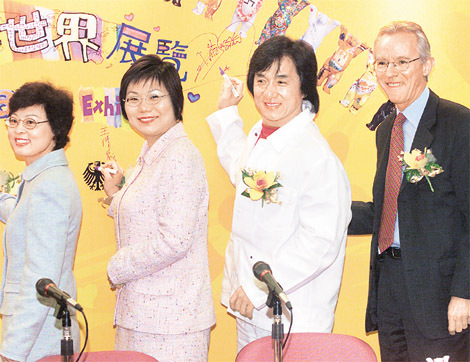 When the movie star learnt that the Buddy Bears carried the message of global peace and tolerance, he wanted to bring the exhibition to Hong Kong, and raised the proposal with the Hong Kong government. The spokesman said one of the aims of the Buddy Bears' trip to Hong Kong is to help raise funds for three charitable organizations: the United Nations Children's Fund, the Community Chest of Hong Kong and the Jackie Chan Charitable Foundation. According to the spokesman, since the exhibition was first held in Berlin in 2002, it has become a signature event to convey message of world peace. On completion of the world tour, these Buddy Bears will be sold by auction in Berlin. Money raised from the auction will be donated to the United Nations Children's Fund. The Leisure and Cultural Services Department of the Government of Hong Kong Special Administrative Region has set up a web page for the Hong Kong Buddy Bear visit! Click here to have a look. Thanks to Marie M. for these photo links. 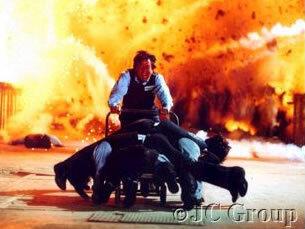 Lots of amazing photos from New Police Story are posted here. Have a look! To help launch Hong Kong's "Sense It! 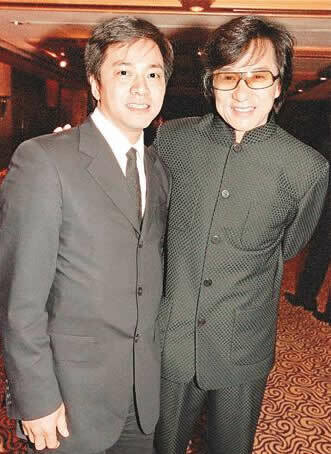 Hong Kong" promotion, Jackie was in Shanghai yesterday having his hand imprints taken for the Avenue of Stars. Read more about it here. If you would like to send a Hong Kong Tourism Board "Sense It!" e-card to someone, click here! 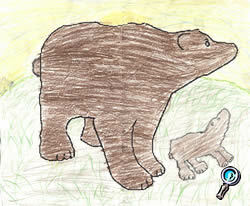 There are a bunch of new Buddy Bear designs waiting to be posted on the Kids Corner. Check back here later or tomorrow to see them all! 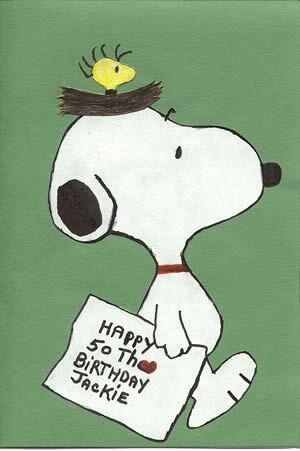 More birthday cards to Jackie have been added to the gallery. Click Snoopy to see them all. The deadline is up to send in birthday cards for Jackie. Thanks to everyone who has sent one in. They will all be packed up together and sent to Jackie in Hong Kong. "It breaks our hearts to have to reply with disappointing news! Say 'SORRY' to the kids on our behalf. Not being able to meet them personally this time is probably the biggest blow!" So you see, kids.....Jackie and Willie are as disappointed as we are at not being able to get together in New York. But don't despair! There's always next time, as Willie says. Around the World in 80 Days Trailer Gets a "B" Rating! Take a look at the incredible, amazing, creative, and beautiful Buddy Bear designs sent in by Jackie's fans. Jackie would be proud of the ability of his fans to take a simple line drawing of a bear and turn it into a dragon, a surfer, a matrix, or any of the other wonderful designs! Thanks to everyone who has sent in a design....and keep them coming! They're just terrific. The March issue of The Little Dragon News is up for everyone to read. Click here! Check back in a day or two for new Buddy Bears and birthday cards for Jackie. Remember, if you want to send a card for Jackie's birthday and have it included with the others in a package sent to him in Hong Kong, you must send your card in before March 21st! Click here for information. Lots of new stuff on the Kids Corner.....thank you to everyone who sent in your amazing artwork! 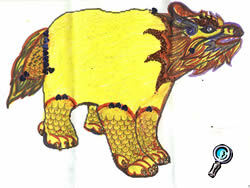 To begin, we have several new Buddy Bear designs done by kids. Click the bear below to go to the Kids Buddy Bear designs page! Frequent Kids Corner contributor Alan Harry has made several new drawings which are posted in the Jackie Chan Art Gallery.Click here to see them. They are, as usual, brilliant! There are several new birthday cards for Jackie on the Birthday card page. One of the cards is over SIX feet long! It was made over the course of 5 days by two German girls, Gertrud and Julia. It's a beautiful card which traces Jackie's history over his lifetime. The photo, below, doesn't do it justice. Click the photo to see all the new cards! 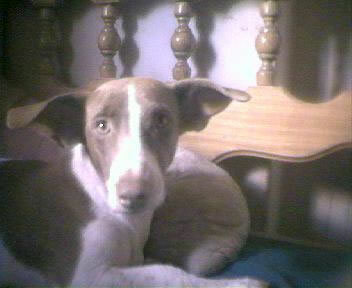 Yes....another pet named after Jackie has joined our gallery. 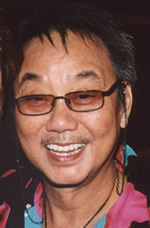 Click here to see all the pets named after Jackie Chan! There are several new coloring projects in Jackie's Coloring Book. Click here to see them! Thanks to Amelia and Aura from Stella Maris Regional School for their wonderful contributions. Here's a wonderful drawing sent in by Anna. It's part of the Jackie Chan Art Gallery here on the Kids Corner. Click the drawing to go to the Galleries! According to StarTribune.com, the "buddy team" of Jackie Chan and Chris Tucker is one of the most "arresting pairs" from cinema! Click here to see the others. 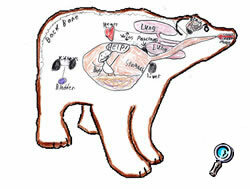 Thanks to everyone who has recently sent in their Buddy Bear designs. Look for them to be posted to the Kids Corner soon! Don't forget to get working on your birthday cards to Jackie. There's only a few weeks left until the deadline to send in your cards! Click here for all the information. Jackie's Shanghai Noon/Shanghai Knights co-star Owen Wilson has said in an interview that he'd like to work with Jackie again....perhaps on Shanghai Dawn? Click here to read the interview with Owen. 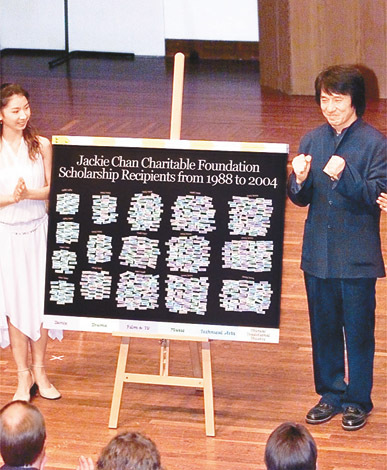 No news yet about tickets for the charity concerts that Jackie's doing in April. Keep checking back and news will be published here as it comes in. A bunch of new Buddy Bear designs came in the mail today. They're really cool....and all of them are from Kids. Click here to see them! This photo shows the Russian training ship, Nadezhda, that left a very grey Hong Kong yesterday, after a 4-day visit to the territories. I took this photo on board the Star Ferry, that travels between Hung Hom in Kowloon and Wan Chai on Hong Kong Island. The 109-metre vessel, is owned by the Russian Maritime State University and is the final stages of a 14-month round-the-world journey. 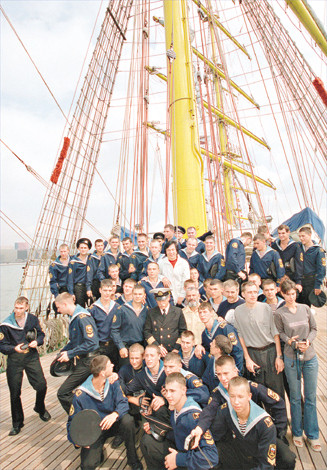 The Nadezhda is mostly used to train cadets how to sail, although the crew has also been carrying out scientific experiments. 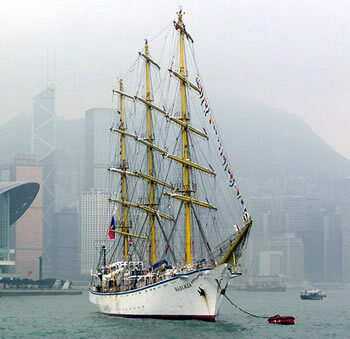 The voyage has been timed to coincide with the bicentenary of the first circumnavigation of the globe by a Russian ship, also called the Nadezhda.